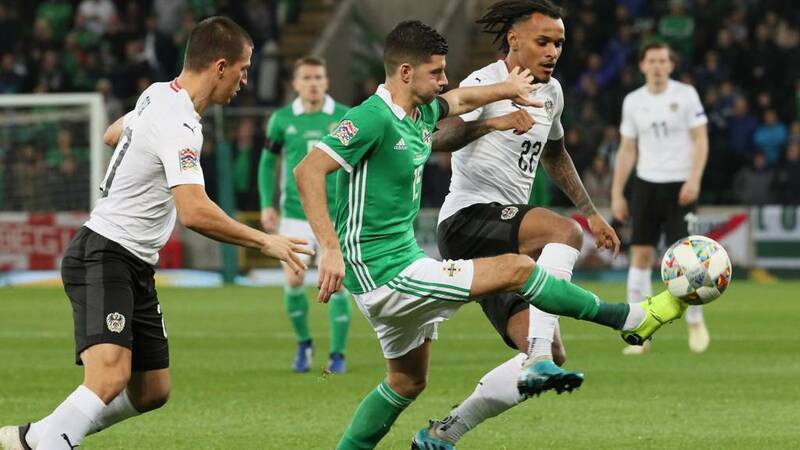 A disappointing Nations League campaign for Northern Ireland, ending without a point. Stayed tuned on the BBC Sport website for more Nations League action as Switzerland host Belgium. Corry Evans scored his first goal for Northern Ireland since September 2010 against Slovenia, 2998 days ago. Austria forward Marko Arnautovic tells Sky Sports: "The first half we did not manage the game and we knew they were going to put some long balls and fight for the second balls. On the major occasions we did well, we did not create too many chances but it was the hope from the gaffer when he put me on to create more chances and we did that. "We can be proud of the win. We wanted to come here, to finish well with a win and we did that. "He (Gareth McAuley) tried to choke me, he tried to fight with me, I don't know why. It is not good to fight with me." Asked about his future: "I concentrate on West Ham, we have a big game on Saturday against Manchester City. What my agent and the club are saying, it is not my business." What we need is for the players to perform for their clubs and then come into international football in good form. There's not a lot wrong with this team - we just need to find someone to start scoring goals. Northern Ireland are winless in their last eight competitive games (D1 L7), their worst run since going nine games without victory between September 2011 and March 2013. This competition has not been good to Northern Ireland with people hitting posts and people missing chances. We have severe lessons to learn. We went to sleep at the start of the second half and they scored - went to sleep at the end of the game and they scored. However, we don't have the required quality around the box. And that is the last kick of the game. A sickener for Northern Ireland. Heartbreak for Northern Ireland in the dying seconds. Michael O'Neill's side have an opportunity for a second but Jordan Jones takes the wrong option and Austria break. The move is rapid involving their main men David Alaba and Marko Arnautovic. The West Ham forward picks out Valentino Lazaro, he rolls the ball out of his feet and curls a delightful finish into the top corner. Balls and bottles flying in the Northern Ireland dugout, O'Neill is incensed. Marko Arnautovic plays a one-two in the area with David Alaba and is about to pull the trigger, but Gareth McAuley gets back in time to clear the danger. Just the two minutes added on. Valentino Lazaro with a Primark touch and the ball rolls out of play. A final change for the hosts. Goalscorer Corry Evans makes way for Paddy McNair with three minutes left. A dodgy moment for goalkeeper Trevor Carson, spilling Andreas Ulmer's ball into the box. But luckily for Carson, it does not drop for David Alaba and he can gather at the second attempt. Would have been a howler that. Austria have Northern Ireland pinned back and been working the ball for a long time. Marko Arnautovic spreads it wide to Stefan Lainer but the cross is cleared by skipper Steven Davis. As we asked at the start, are you watching Mark Hughes? If he is not, he should be. It has been a masterclass from Davis tonight. Seven minutes plus stoppages remaining. Northern Ireland are going more direct now towards striker Kyle Lafferty's huge frame. He earns a free-kick after drawing a foul from Aleksandar Dragovic. Steven Davis swings in the set-piece from out wide, but it sails all the way through for a goal kick. Is this what Uefa had in mind? There's an intensity to this game now that you simply wouldn't find in an international friendly. After equalising so soon after Austria took the lead, Northern Ireland are having a right at go at getting the win. And the manager has made a bold double substitution by bringing Kyle Lafferty and Gavin Whyte on. The home fans never need to be asked twice to sing their Kyle Lafferty song and his presence has definitely cranked up the Windsor Park atmosphere, which was already coming to the boil nicely. The competitive element of the Nations League shining through. Both Gareth McAuley and David Alaba go into the referee's book. Wouldn't get this sort of battle and competitiveness in an international friendly. Gareth McAuley and the short-fused Marko Arnautovic go nose-to-nose after a 50-50 challenge in the air. David Alaba is particularly incensed by the Rangers man putting his arm around the West Ham striker's neck.